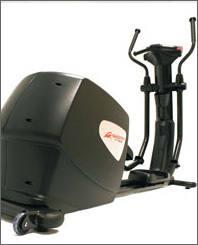 Smooth Fitness has been offering top-quality exercise equipment to fitness enthusiasts for over 25 years. 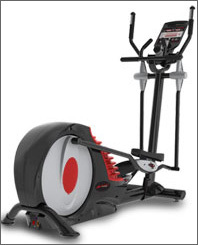 They are one of the largest retailers of home fitness equipment and for good reason. They offer a full selection of treadmills and ellipticals that incorporate a wide range of advanced features and cutting edge technology. 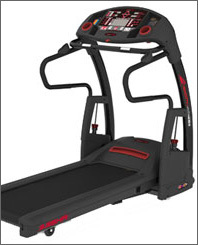 Innovative features such as wireless heart rate control for real-time customized workouts, high-tech suspension systems for exceptional comfort, next-gen advanced ergonomics, and multimedia functionality on select products ensure that Smooth Fitness treadmills and ellipticals are some of the most advanced, full-featured home fitness solutions that can be found on the market today. Smooth Fitness equipment consistently leads the way in customer satisfaction surveys because they build high quality equipment for an affordable price. 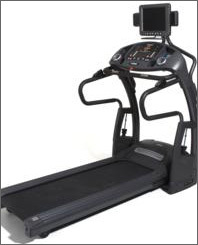 Smooth Fitness utilizes commercial grade components in many of their treadmills and ellipticals and every piece of exercise equipment that they produce is designed to provide a lifetime of trouble-free operation. In addition every Smooth Fitness product is backed by a comprehensive lifetime warranty so no matter what happens you’re covered. And to top it off, Smooth Fitness is so confident in the quality of their products that they offer a full 60-day money-back guarantee! With rock solid backing like that you’ve got nothing to lose so what are you waiting for? Check out the selection of treadmills and ellipticals available from Smooth Fitness and find the perfect workout solution today! Smooth Fitness stands behind every treadmill and elliptical that they manufacture and they completely guarantee your satisfaction. 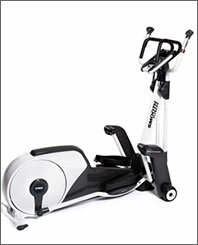 Simply purchase your machine (direct from Smooth Fitness) and put it through its paces for up to 60 days. If you’re not 100% satisfied with the results, simply contact their customer service department for a Return Merchandise Authorization number and return the machine (including any accessories) in its original condition and packaging to receive a full refund, less shipping & handling. Item must be received no later than 10 days after your return authorization is issued. 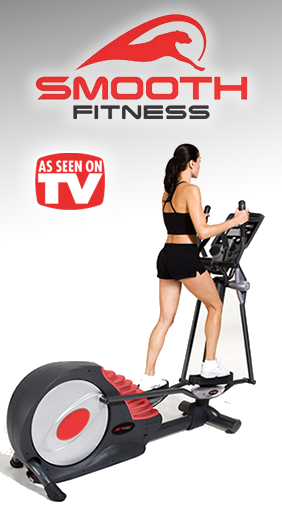 Smooth Fitness 9.45TV treadmill is a full-featured treadmill in a class by itself. The top of the line treadmill’s most notable feature is also its most prominent – a built-in high quality 15″ LCD TV mounted above the console. And of course the 9.45TV treadmill offers all of the other features and functionality you would expect from Smooth Fitness. One of those features well worth highlighting is the wireless heart rate control which continually monitors your heart rate and dynamically adjusts the settings of the 9.45TV to ensure you get a superior workout. It’s just one of the ways in which the 9.45TV lets you tailor your workout to your body’s exact needs. 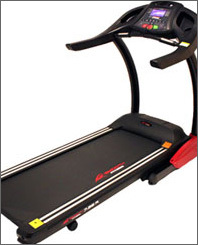 Smooth Fitness 9.45ST treadmill offers quite a few advanced features which make it an intriguing choice if you’re looking for a quality treadmill. One of its top features is the Smooth Fitness Hydra suspension system. This advanced suspension system features variable cushioning which allows you to adjust the shock absorption to perfectly fit your individual running style. By tailoring the amount of cushioning you’re able to make your workout more comfortable, efficient and effective. 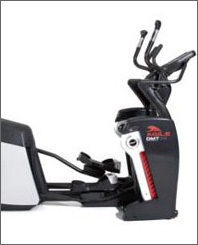 Another feature that’s exclusive to Smooth Fitness is QuickChange motion control. This innovative technology allows you to control the speed and motion of the 9.45ST treadmill with just a wave of your hand! Smooth Fitness 9.35HR treadmill is a full-featured treadmill with advanced functionality as well as a variety of intriguing features. One of its most interesting features is QuickChange motion control. This technology, which is exclusive to Smooth Fitness, lets you control the treadmill with hand gestures. All you have to do to change the speed or stop the treadmill is wave your hand – no more being distracted by fumbling for controls! The 9.35HR also features another Smooth Fitness exclusive – the Hydra suspension system. This high-tech suspension system utilizes adjustable cushioning so you can set the shock absorption to suit your exact running style. By actual user testimonials it makes quite a difference in runner comfort, allowing them to run longer and burn more calories. Smooth Fitness 7.35 folding treadmill offers numerous innovative features which make it stand out among the crowd of competing treadmills. Smooth Fitness’ exclusive Im-Pression shock absorbing cushioning technology, which is unique to select Smooth Fitness treadmills, ensures that you receive a superior low-impact running experience which is gentle on your back and joints. You’ll also enjoy how all of your important workout stats are readily visible on the 6-1/2″ SmoothControl console display. And if require a little extra room for running the 7.35 is just what you’re looking for. 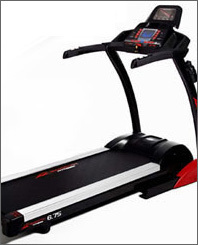 The 7.35 is perfect for large runners with a long stride as it features a roomy treadmill surface that measures a roomy 20″ x 62″. Smooth Fitness 6.75 folding treadmill is a great choice if you’re looking for a treadmill that’s packed with innovative features and advanced technology. Smooth Fitness’ exclusive Im-Pression shock absorbing cushioning technology is engineered to provide a firm push-off for your rear foot while simultaneously providing a soft landing for your front foot. The net effect is a low impact workout that’s much easier on your joints and back. 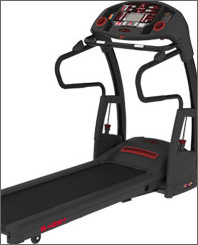 Another feature that makes the 6.75 model unique among folding treadmills is the SmoothDrop folding frame which is an exclusive to Smooth Fitness. 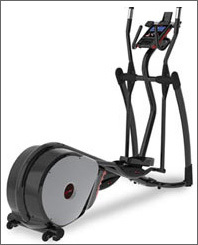 When you’re done with your workout simply fold the treadmill for storage with just a touch. The SmoothDrop system’s gas shocks will handle all of the heavy lifting!